A spacious New York City hotel with all the comforts of home and a location in the heart of the city that never sleeps, is a dream come true. Expansive apartment-style suites feature fully outfitted kitchens with a stove, oven, microwave, dishwasher and kitchenware for up to six people. The Best Western Plus Hospitality house dishes up complimentary breakfast daily. Enjoy piping hot eggs and waffles, cereals and yogurts, fruits, pastries, juices and 100% Arabica coffee. Best Western Plus Hospitality House has you covered. No other New York City hotel can compete with these oversized rooms and great location. 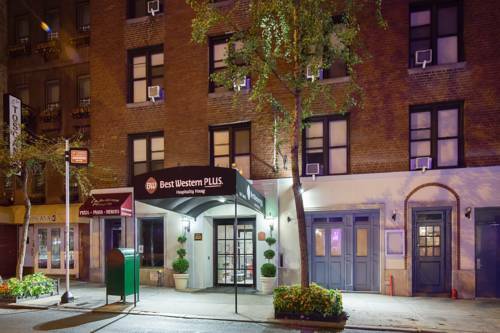 We're located within walking distance of Times Square, Grand Central Station and numerous transportation hubs. Free Wi-Fi/high-speed Internet access and a fitness center keep you connected and up with your fitness routine. The unique apartment suites at Hospitality House are just the beginning. Enjoy easy access to the Empire State Building, Rockefeller Center , United Nations and Chrysler Building. Business travelers enjoy a homey environment complete with friendly staff. This New York City hotel regularly hosts employees of embassies, consulates, and numerous Fortune 500 companies' headquarters. This property is designed to be a home away from home; oak floors and 11-foot ceilings are a warm welcome. Choose from one bedroom apartments suites or apartment suites that offer two bedrooms for your stay. Only Simmons Beautyrest pillow top mattresses are offered to guests of this New York City hotel for a restful nights sleep. Dozens of free classes are complimentary like yoga, kettlebell, and Pilates at our local fitness center. There is also a basketball court, a sauna steam room, and two inviting swimming pools all there free for our adult guests. Bath & Body Works treats await you in your bathroom. Book your room at the Best Western Plus Hospitality House today! Enjoy your stay! Adjacent to La Belleza Pizzeria III, pizza, 9:00 a.m. to 7:00 p.m.
204 mile(s) from Washington, D.C.